Bill Kurtis (left) interviews Mayor Rahm Emanuel Monday evening. It looked like a good idea on paper: get together 47 Chicago radio stations – including suburban sticks – and Rahm Emanuel was going to address the city on major issues. At the same time, local radio stations were demonstrating their commitment to their communities. Chicago Mayor Rahm Emanuel – who is a master manipulator of media (ask the very few who watched CNN’s Chicagoland in 2014) was interviewed by Bill Kurtis Monday night for this “Chicago Radio Town Hall” from 6 to 6:30 p.m. and airing as a “roadblock” – airing on 47 stations and produced by the Illinois Broadcasters Association and the Radio Broadcasters of Chicago. Yours truly didn’t catch the broadcast live, but listened on-demand on WGN-AM’s website. And needless to say, what Emanuel talked about was no different from what he usually says in his press conferences and broke no new ground. Mayor Emanuel talked about the city’s growth – like anyone in Chicago’s poorest areas actually cares. Mayor Emanuel did address the city’s violence epidemic, Chicago’s declining population; and the future as a sanctuary city in a Trump presidential era. Of course, what he didn’t discuss was the ongoing racial tensions after a recent police shooting in the southwest side neighborhood of Mt. Greenwood; and the closure of 50 public schools – not to mention the 2014 police shooting of LaQuan McDonald. 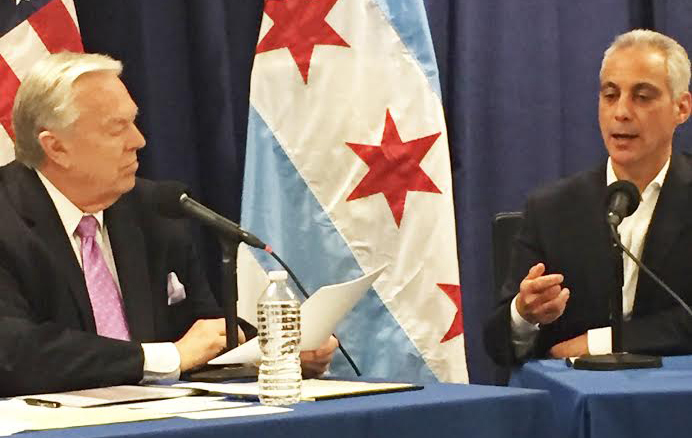 To yours truly, this “town hall” meeting was nothing more than a publicity stunt – not only for the Emanuel but also the radio stations involved, who continue to battle listener erosion. The station groups participating reads like a who’s who of radio conglomerates: iHeart Media, Cumulus, Hubbard, Salem, CBS, and Alpha, who represents several suburban sticks. Notably absent was Crawford Broadcasting, owners of urban WPWX and urban AC WSRB, both licensed to Hammond, Ind., just over the state line from Chicago and Calumet City. In the half-hour presentation, Kurtis alluded to “radio executives” in the crowd at the interview – which leads yours truly to wonder if Mayor Emanuel has “buddies” on the IBA and RBC boards, who convinced them this was a good idea. The Chicago Way, of course. Why is this Rahm Emanuel interview broadcasting on all major Chicago radio stations? It's ruining my drive home from work. #RahmEmanuel just had a "town hall" broadcast simultaneously on 47 chicago radio stations. Nothing but a re-election/investor fluff piece. I'm mostly a Rahm supporter, but Chicago radio stations should be embarrassed they allowed themselves to be used for such rank shilling. The only people who praised this (like the tweet above this paragraph) are radio consultants – most of whom don’t live in the Chicago area. This “town hall” was an open invitation for radio listeners – especially those who don’t live in Chicago proper – to whip out their MP3 players or head to Sirius/XM or Spotify – poison for radio broadcasters. As I said a few days ago, this was a good idea – doing what radio broadcasters should do. But the execution was poor – for one, the half-hour format sucked – there is no way you can address serious issues with a running clock as the presentation felt rushed. Also, it was clear Emanuel was using this to promote himself and only himself – like he always does (On the other hand, we’re glad it actually wasn’t longer.) This is what happens when Big Media – and this is in any market – uses “industry trade lingo” to push their message about their commitment to their communities – it gets lost and the listeners don’t understand it. This “town hall” fell into the same kind of trap another “roadblock” did. Remember 1990’s Cartoon All-Stars To The Rescue, airing simultaneously on Fox, ABC, CBS, and NBC? The half-hour had teenaged Timmy or whatever his name was smoking dope and stealing beer and Garfield The Cat or The Smurfs or whomever showed him what life would be like if he kept on with his substance abuse binge – don’t remember seeing pictures of his grave. The special was about as effective as a toothpaste commercial. This “historic” broadcast – or waste of time – whatever you want to call it, was a gigantic disappointment, and it’s doubtful you’re going to see this “roadblock” again. If Chicago radio wants to demonstrate their commitment to our communities – maybe they should stick with the canned food and coat drives. They’re more effective than a con man Mayor sucking up thirty minutes of their airwaves.